Important role of the lipid droplet as an essential platform for HCV assembly was reported by Miyanari et al. (Nat. Cell Biol. 9, 1089–1097, 2007) and reviewed as a pioneering work to decipher HCV assembly (Hepatology 47, 343–345, 2008). This report has been cited more than 60 times to date, showing that the report impacted on the many virologists. Miyanari et al. clearly demonstrated for the first time that the HCV Core recruits nonstructural (NS) proteins and replication complexes to lipid droplet-associated membranes, and showed that this recruitment is essential for producing infectious HCV particles. 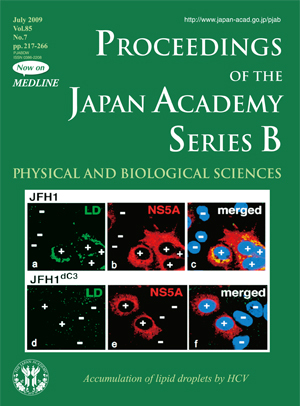 The authors also found accumulation of the lipid droplet in HCV replicating cells in the Core dependent manner by the following experiment, and the data was illustrated in this cover. 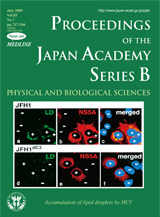 The findings by the authors are reviewed on pages 217-228 in this issue. The infectious HCV genome, JFH1, or the genome lacking Core coding domain, JFH1dc3, was introduced into human hepatoma derived cell line, Huh7, by electroporation. Then, the lipid droplet in HCV replicating cells was analyzed by confocal microscopy using BODIPY 493/503, a marker for the lipid droplet (green in panels a and d) and the antibody against HCV NS5A (red in panels b and e). Nuclei were visualized by DAPI staining (purple in panels c and f). HCV genome-replicating cells represented by NS5A positivity were shown “+” and those cells negative for HCV replication were“-”. Accumulation of the lipid droplet in cells bearing the HCV full genome (JFH1) was observed (panel a), while no such accumulation was seen in cells bearing the HCV genome lacking Core coding domain (JFH1dc3) (panel d).